Hi all, I'm returning to Blogland after a brief spell away... goodness doesn't Chrsitmas get in the way of crafting!?!! However I mark my return by proudly announcing that I am a guest designer for Crafts 4 Eternity for the month of December!! This weeks challenge is to follow a sketch, use brads & a santa image, I don't know if you can spot my santas hidden away under all that inking but they are definately there I promise!! And talking of Santas, Michelle has provided a free Santa digi-image for you to download, how cool is that?! I fancied getting a bit shabby for this challenge which for some reason I feel more confident about when I work in minature so this is an ATC. 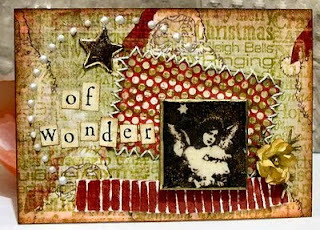 Made with papers from Michelle's gorgeous November kit & paper artsy stamps. Thanks for looking, I can't wait to see what you come up with!! I totally love your amazing card! It is so gorgeous and beautiful!